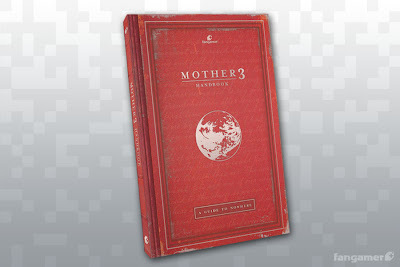 I've barely played the fan translation of Mother 3 thus far, but I've played enough of it to know that I want to play more of it--and that I want a copy of the awesome "Mother 3 Handbook" created by the folks at Fangamer. Actually, the first edition of said handbook--all 240, full-color pages of it--was sold via Fangamer back in early 2009. As far as I'm aware, though, it quickly sold out and, as a result, many Mother 3 fans have been clamoring for a reprint ever since. For more information on what's included in this 270-page guide, or to order one for the EarthBound/Mother fan in your life, go to handbook.fangamer.com. I've got one of the originals...it's SO wroth the price. And...now I want a hardcover! You ... you've never ... had much of an interest in Mother, Kimimi? Honestly, that surprises the hell out of me! Why are you so disinterested in the game, if you don't mind me asking? You have one of the original printings, Justin? Ack! So, you think it's worth the price, eh? I've literally had the Fangamer site open -- and a copy of the hardcover version in my "cart" -- for the last few days, but I haven't been able to pull the trigger yet. Arrrrgh!!! I just haven't seen anything about the series that's made me think "I really should get one of those ASAP". Before I'm chased off the internet I should also say I've seen nothing that's made me think "Those games look rubbish" either - they just don't appear to be my cup of tea, that's all. Oh, you don't have to worry about being chased off, I was just curious. I know people can be a bit rabid about this series, and that alone can be quite off-putting, I'm sure, but in my experience the interest in the Mother games is pretty well warranted. Are you worried that they're just too ... silly for you? Anyway, I'd highly recommend giving Mother 2 or 3 a try at some point, just to see if they're your cup of tea or not. If not, no biggie, but, man, I wouldn't want you assume that without knowing one way or the other! I've not written them off as not worth playing or anything like that, they just don't "blip" on my gaming radar if you see what I mean. Is that directed at me, Justin? As in, "buy the damn handbook"? Oh, that's great that you're actually going to buy one of these as a gift for someone, Marcus! Which one are you buying her, if you don't mind me asking -- the hardcover or the softcover version? Hey there, Adam! Actually, as far as I'm aware, playing Mother 3 using GBA emulators on any OS is problematic. You can play the game, but the rhythm aspect of the battle system is thrown off due to the lag introduced via the emulators. So, I'm guessing the best way to play Mother 3 is using a real cart and a real GBA (or GB Micro) or a flash cart and a real GBA/GB Micro. Harrumph. I'm thinking I'll go all out for the hardcover version. Nothing against softcover, but there's something a lot more "official" about a hardcover book, if that makes any sense. Besides, it's nice to show extra support projects like these! Bryan, you know that in Europe and Italy on Mother 3 (and tuti previous titles), never made it. We lost a game that belongs in the history of video games! Oh, I'm with you, Marcus! If I get one, I'll definitely get the hardcover version, especially since it's just $9 more. Yes. Yes it is, Bryan. Wow... I've never played Mother 3, but that is BEAUTIFUL! I think... I have to buy it (maybe I'll start an oversized game book collection with my Ni no Kuni DS set lol). Speaking of which, I can't wait to hear what you think of Ni no Kuni DS! Are you planning to get the PS3 version eventually, too? The Ni no Kuni book's like nothing else I've ever seen and really does add to the game, it's a shame they didn't incorporate it into the PS3 version in the same way. Do you own the DS version of Ni no Kuni, Kimimi? If so, what do you think of it? Yep! It's basically Studio Ghibli: The Game, so how much fun you have with it depends directly on what you think of Ghibli-style storytelling/characters/design. I thought it was wonderful from start to finish, and the Magic Master was obviously created with a lot of care and attention - it's not just a glorified walkthrough/copy protection book, if you read it thoroughly you'll find secrets in game you wouldn't otherwise find and it really fleshes out the world. Oh, that sounds wonderful, Kimimi -- and makes me sad that the game will never be released in English (or that I've never learned Japanese).